Elegant and luminous, these Lizzie Fortunato will highlight your look. 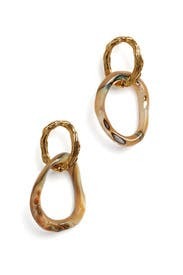 Gold plated double drop earrings with hammered top and opalescent mix of green, blue, and grey bottom. Post backs for pierced ears. 2.8" long.